Armchair Fan wrote: I don't have an answer, but I must say it's the same in football or other team sports (not all of them though). Shorts have almost always been dark blue (some give it a royal explanation, it's House of Bourbon colour) and after the Civil War national team even wore full blue because red was linked to the defeated republican side. Plenty of examples where sports teams play in colours that aren't anything to do with the flag colour(s), e.g. Australia and New Zealand in Rugby. Italy seem to play in Blue in most (all?) sports. In football you have the New Zealand national side playing all in white, simply because someone decided that no football team was allowed to play in black (not sure if this has since been reversed). Well, in the case of Italy it has a royal explanation too if I'm not mistaken. Or Germany playing in Prussian white. Armchair Fan wrote: Well, in the case of Italy it has a royal explanation too if I'm not mistaken. Or Germany playing in Prussian white. I once did a collection of those "sporting colours". No idea how I missed the blue in Spains jerseys. Named because due to a former FIFA regulation reserving black for referees at the time. Under Lewis Williams leadership Santboiana brought some interesting specimens, but many of them just came for a 'sabbatical' season and then returned to NZ. As the article states, he helped them to clinch Copa del Rey final at Zorrilla against El Salvador. I've done some interesting calculations for El Salvador forum, so I'll share them here too. Some were arguing how many really Spanish-formed players were in the Liga Heineken starting XV this season... After six rounds the average in 7.1, down from 8.2 in the six first rounds of 2017-18 season. And in 2014-15 season it was around 10 or 11 out of 15. I always thouht that the blue shorts were a reminiscence of when the team played with the colours of Falange, the fascist party supporting the Franco regime, but searching for confirmation I found that they were already in use in the 1920s. It's a tradition long stablished and almost impossible to change, but in any case, I wouldn't mind to play with yellow shorts now and then. The Sevens team had to use them sometimes with the red shirt in some games, and I really liked the result. And even if red nd blue are the most usual colours, other sports have their own combinations. Field hockey team plays with red shorts and yellow shirts. Basketball team used to play with blue shorts, but since the 80s plays with full red kits (being the alternative kit full white). Last edited by Armchair Fan on Mon, 05 Nov 2018, 10:24, edited 1 time in total. What's this? Red, yellow or nothing at all? Find out with our next Liga Heineken résumé... El Salvador forum is boiling. Armchair Fan wrote: What's this? Red, yellow or nothing at all? Find out with our next Liga Heineken résumé... El Salvador forum is boiling. Definitely a penalty and with the direct contact to the head could even qualify as a yellow. Ref gave a simple penalty initially and TMO called it a red card judging by the two cameras you see in screenshots. El Salvador was one man down 10 minutes into the game and lost its first match of the season. TMO (only working in one game per round, not all league games) was hyperactive and denied UBU-Colina Clinic three tries (two of them suspicious enough), forced another yellow card for El Salvador and said there was nothing to see in a late tackle by UBU-Colina Clinic which sent home one of El Salvador players. El Salvador coach was furious, one of the team managers was red carded for insulting an assistant ref, an UBU-Colina Clinic celebrated their winning try by ironically making the TMO signal with his hands... Crazy. Armchair Fan wrote: Ref gave a simple penalty initially and TMO called it a red card judging by the two cameras you see in screenshots. El Salvador was one man down 10 minutes into the game and lost its first match of the season. Depends on whether it was seen to be intentional targeting of the head or accidental. From the sounds of it the TMO took the position that it was intentional and therefore a red card. It's hard for me to determine from the stills but it looks from what I can see to be accidental. So a YC would have sufficed in my opinion. Regarding the TMO situation. They've become a real issue in the game. Interfering with games mid play is a big problem. It's about time there role was redefined and on field decisions put solely in the hands of the refs in the middle. The TMO should be there to spot any missed foul play and put forth citing recommendations but they never should have such a big and often disruptive impact on the play. We've got playing numbers from 2017-18 season and they aren't good. There is a strong deceleration, with only a 4.1% growth (smallest since 2013) mostly driven by female numbers. The causes have already been exposed multiple times in the topic. 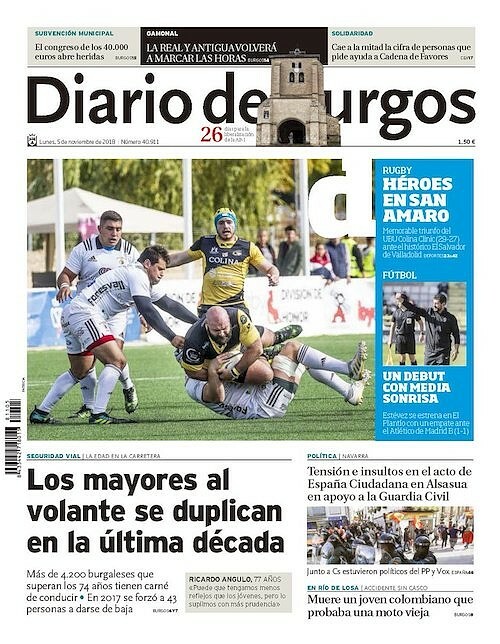 Catalonia and Euskadi have been losing male players for a long time now and aren't what they used to be, Madrid shows worrying signs in underage rugby (U18 players have been decreasing for four or five years, there are less kid teams this season) and other regions found big problems due to lack of facilities. FER put itself a goal to have 40,000 by 2020, but with these stats and missing RWC it's going to be too tight. Mickael de Marco is an awesome addition for Spain. Should still have a few good years left in him. Last edited by Armchair Fan on Tue, 13 Nov 2018, 10:37, edited 1 time in total. 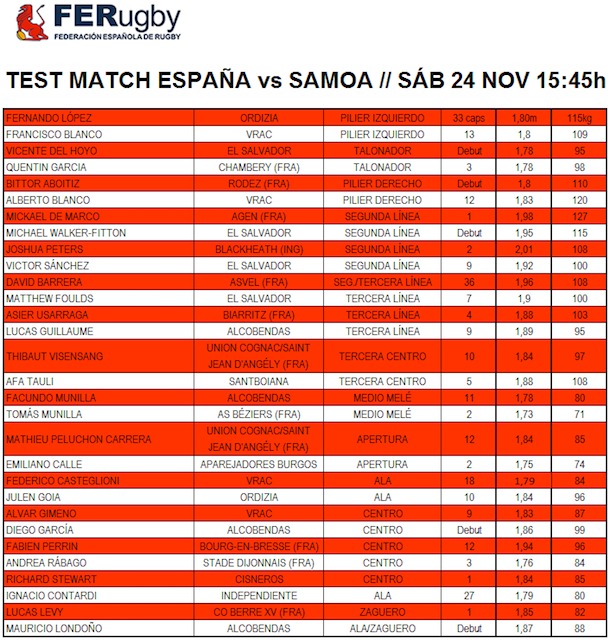 The league takes now a week off as Spain will use a heavily local-based team for its test match against Namibia. 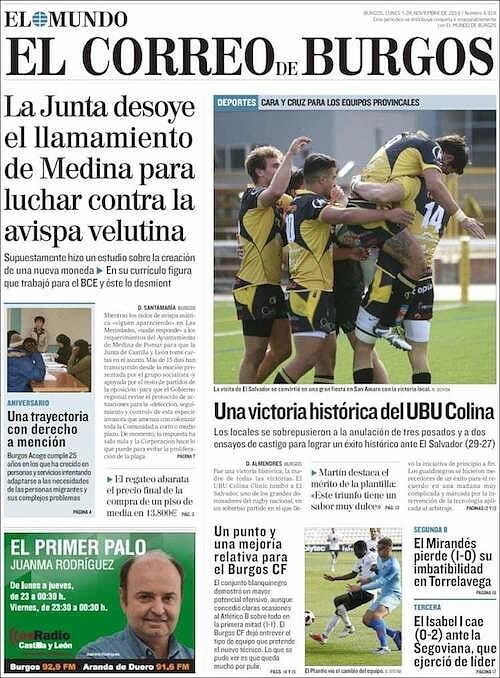 Watch out the following week because we will have a big clash between Alcobendas and VRAC, although deprived of some of their biggest stars due to Spain v Samoa game. You've seen me in the past bragging how many teams were taking part in underage Spanish championships and tournaments. But I'm afraid this is over. FER has released calls to tender for these tournaments hosting rights and they have decided to put a cap for all of them, particularly hitting U16 and U14 tournaments. Last year we got 52 and 58 teams in those, but FER has put a cap of 40 and 48, probably to prevent them to keep growing and make them unaffordable due to lack of pitches. On the other hand, U18 and U16 regional championships have been expanded and will be played in round robin format: 5 weeks instead of 3. This season top tier will be played by Madrid, Catalonia, Valencia, Andalucía, Balearic Islands and Navarra. If anybody wonders who is missing, Basque Country decided years ago to stop playing there and Castilla y León (Valladolid) got relegated against Balearic Islands last season. Armchair Fan wrote: You've seen me in the past bragging how many teams were taking part in underage Spanish championships and tournaments. But I'm afraid this is over. FER has released calls to tender for these tournaments hosting rights and they have decided to put a cap for all of them, particularly hitting U16 and U14 tournaments. 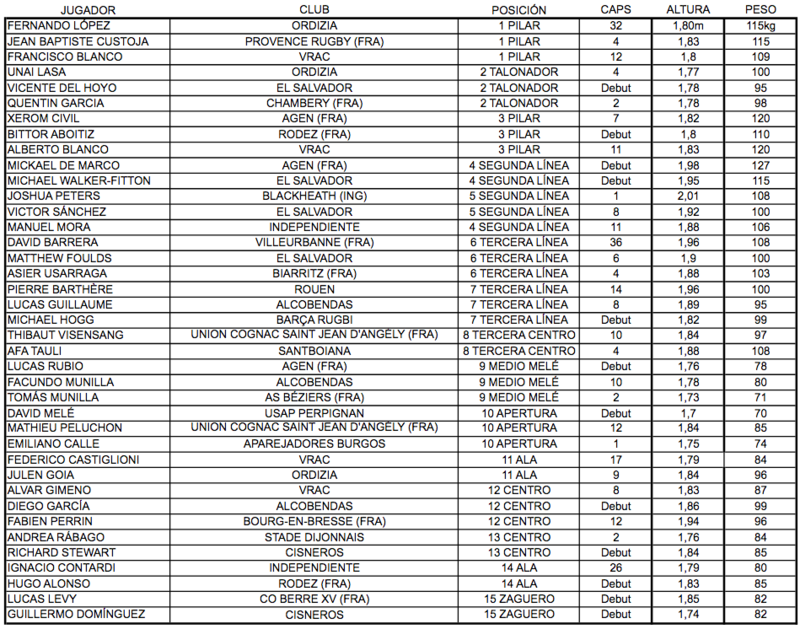 Last year we got 52 and 58 teams in those, but FER has put a cap of 40 and 48, probably to prevent them to keep growing and make them unaffordable due to lack of pitches. Logical next step. I would have capped earlier and instead form a 2nd or 3rd level tournament. Anything out how those teams will qualify for the tournament? Second level tournament already exists in U18 and U16, within the same event. No words yet on how teams will be picked. Spain's coaching hoping to lure the Maori in 2019. Perfect opportunity for Georgia, Romania and Russia to work with Spain to get the Maori to tour next year. Romania maybe, but Georgia won't have a November test window right after RWC.